Almost all laptops have ability to connect external display such as CRT monitor, flat panel display or projector. In this article we will tell you process of connecting external display to your laptop. The external display can be connected through 15 pin port usually found near left/right corners or back side of the laptop. Once connected, your laptop may automatically switch to the new external display or you may be required to press a sequence of keys in order to switch from the laptop to the external display. There is a key sequence to toggel between your laptop and external display. It may be Fn + F3, F4, F5, F8, or F9 depending upon your computer. 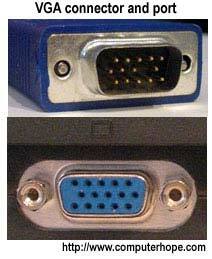 The function key may be labeled as CRT/LCD or have a picture of a monitor on the key or close to the key. Unfortunately, the keys pressed to switch displays is dependent on the model and manufacturer of the laptop. If none of the above key sequences work, consult your laptop documentation or consult your laptop manufacturer. Getting more screen inches isn’t the only reason someone might want to connect a monitor to a laptop. Here are a couple of scenarios that spell out some of the other benefits. Multi-tasking – Connecting your laptop to a monitor enables you to go into split screen mode, where you can be watch a movie on your PC monitor and tweet about it on your laptop screen. This gives you a cool setup that prevents you from having to keep toggling back and forth between applications. More screen real estate – By connecting your laptop to a monitor, you can literally double the size of your available screen space. Functions can be moved from one screen to the other so that you don’t have to shrink windows down or toggle to see two programs at the same time. This type of setup is ideal for a number of scenarios, from leisure activities like video chatting while you’re on Facebook* to updating a work spreadsheet while you’re referencing facts on another platform. Extra options in Windows 8 – With Windows 8, you can choose between traditional desktop view or the new metro menu. But when you connect your laptop to a second desktop screen, you can actually have your proverbial cake and eat it too by running both at the same time. For more Queries, comment below. Don’t forget to like/share.